in an intricate manner, with buildings out in an intricate manner, with buildings spaced providently and courtyards mutually containing, and all the components of the complex zare cunningly grouped to camouflage a rather camped space. As a paragon of the south Chinese landscaping style of the Ming and Qing dynasties, it is a MUST for all visitors to Shanghai. The neighboring Yuyuan Bazaar, known among old-timers as "Old City God's Temple Market", is a rising tourist and shopping center where visitors loitering among a cluster of shops, restaurants and recreation facilities invariably find themselves making a tour of discovery of local folklore and Ming and Qing architecture. The Yufo (Jade Buddha) Temple was built in 1882 but after all those years it remains in perfect condition as a sanctuary of Zen Buddhism. The temple derived its name from a jade statue of Sakyamuni from Myanmar. The image of the Buddha, his graceful posture, and the serene and calm look on his face are, to put it just in one word, mesmerizing. The picturesque Bund, extending for 1.5 km on the shore of the Huangpu River, is an emblem of Shanghai. A total of 52 tall buildings of various heights tower over the river along the western side of the Bund, looking like a museum of modem world architecture. The wide riverfront promenade along the eastern side of the Bund provides a captivating view of Shanghai. 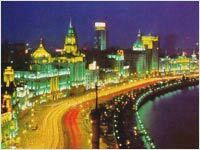 When lights are turned on between 19:00 and 21:00 p.m., the Bund has the best nocturnal scene to offer. which runs past some of the major landmarks of shanghai as a port city. Built during the Five Dynasties, the Longhua Temple is the most venerated and largest temple in Shanghai. Apart from its long history, the allure of the temple also lies in the Longhua Pagoda and the peach blossoms in its courtyard. Visitors are invited do "be a Shanghai citizen for a day" by visiting families often those with several generations living under the same roof-in some residential quarters. In this way they can experience the delights of family life the oriental way. Flanked on both sides by famed shopping centers, department stores, specialty stores, exotic restaurants and cultural and recreational facilities, the 5-km-long Nanjing Road is the most sophisticated shopping and tourist complex in Shanghai. Every day it is thronged by more than 1 million visitors. The "Oriental Pearl" TV Tower is a new landmark of Shanghai which faces the Bund across the Huangpu River at Lujiazui, the busiest part of Pudong new Area. At a height of 468 metres, it is the tallest TV tower in Asia. An elevator whisks visitors to the tower's observational deck at a height of 263 metres, where they can feast their eyes on a panoramic view of shanghai. The tower is equipped with tourist service facilities, including eateries, shops, recreational including eateries, shops, recreational centers and a hotel. Open 8:30-21:30. The People's Square, which was refurbished and expanded in 1994, is the political and cultural center of Shanghai. The square is home to a gigantic music fountain, several dozen thousand square metres of green patches, the Shanghai New Museum with a unique design, the magnificent City Hall, a spacious underground shopping center, and the splendid Grand Shanghai Theatre. A stroll on the square enables one to gain some idea about the modern chic and refined elegance of Shanghai and its people. Patterned after the settings of the 18th-century Chinese classic A Dream of Red Mansions, the Grand View Garden is an 8-hectare affair by the Dianshan Lake in Qingpu County. The Shanghai Museum at the People's Square is in the possession of a collection of 123,000 cultural artifacts in 21 categories, but bronze ware, ceramics, calligraphy and painting are its forte. A vast collection of exhibits, world-class architecture, and high-tech facilities explain why the Shanghai Museum can attract visitors who come in a constant stream from every nook and cranny of the world. Situated on Fenyang road and established in 1956, this is China's first comprehensive center for the research of Chinese arts and crafts. Its 19 departments are staffed with a galaxy of virtuoso craftsmen in such fields as woolen needlepoint tapestries, embroidery, ivory carving, jade carving, dough modeling, and porcelain carving. Visitors are in for quite a few rare artistic delights. What's On: Large-scale float parade, open-air concert, demonstration of Chinese and foreign tea ceremonies, international symposium on tourism, exhibition of culture and art associated with the classic A Dream of Red Mansions. 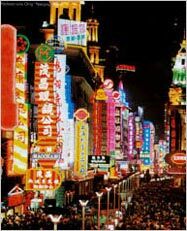 Other programs include the tour to "be a Shanghai citizen for one day" and evening cruises on the Huangpu River. There are also tours for those who return from overseas to seek out their ancestral roots.